W.K. Kellogg auditorium is one of many Battle Creek buildings that bears the Kellogg name. W. K. Kellogg was Will Keith Kellogg, who along with his brother, Dr. John Harvey Kellogg, are the Kellogg's of Battle Creek, Michigan. W.K. Kellogg invented Corn Flakes and founded what is today, the Kellogg Company. W. K. Kellogg was very philanthropic to his hometown. The auditorium pictured above was built by a donation from W.K. Kellogg. Today, W.K. Kellogg is home to the Battle Creek Symphony Orchestra. The Art Deco style auditorium underwent a major renovation in the mid 2000's. Renovations were made to include new seating, upgrades to the heating and air conditioning systems and restrooms. New sound and video systems, lighting, stage rigging and more were updated to make the auditorium what it is today. W.K. Kellogg had a thing for the number seven. He was the seventh son of the seventh son and in his honor the seventh seat in the seventh row is forever reserved for Mr. Kellogg. Enjoy a few pictures from their early married life together. Where would our blogs be without readers? My blog readers are THE BEST! I certainly appreciate all the comments that have been written on my blog. I reply to each and every one. It is one of the parts of blogging that I enjoy. I appreciate the emails I have gotten asking for more information or giving me more information. I especially appreciate a reader that was willing to translate a German Record for me. I was grateful when I received a translation of the above image, from one of my blog readers, Rafael. What a generous reader! Here is the translation below along with Rafael's notes. Thank you so much, Rafael. Have you noticed that you don't get as many blog comments as you use to? I have and I was thinking of new ways to engage with my readers. One of the ways that I decided to engage with my readers is through Facebook. 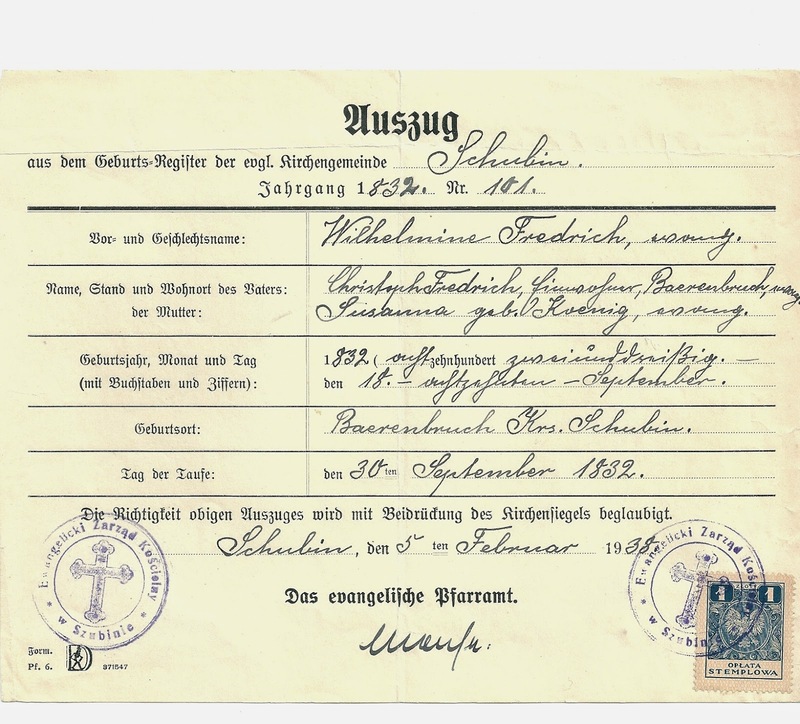 Facebook is a great tool to use for genealogy. There are over 3000 Genealogy related groups on Facebook. I even have a Fredricks Genealogy Group where I share my research and pictures I have on my Fredricks family. It is a great way to interact with my Fredricks' cousins. Now, I am introducing to my readers, my Journey to the Past Facebook page. My page on Facebook is where I hope to interact with my readers, other bloggers, Genealogy Industry Brands and more. I will be sharing my new blog posts here. I will be sharing other information related to genealogy as well. 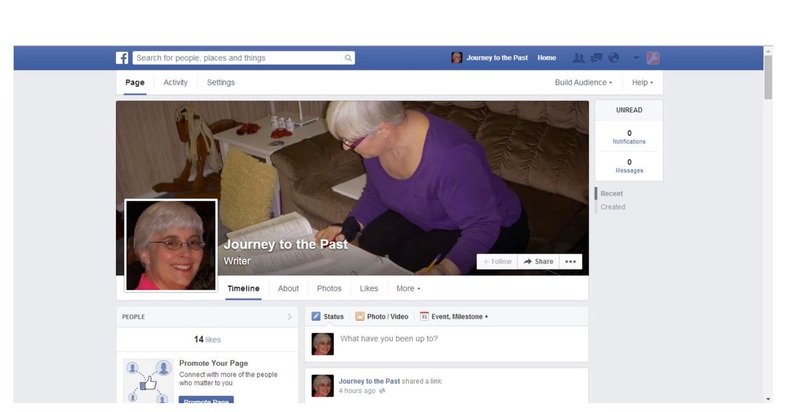 I encourage you to check my Journey to the Past Facebook page out and please like me! Do you want to set up your own Facebook page? Setting up a Facebook page is quite simple. Click to check the box next to I agree to Facebook Pages Terms. That is all there is to it. If I can do it, anyone can do. Already have a Facebook page? Great, feel free to share your link in the comment section for my readers to see and like. 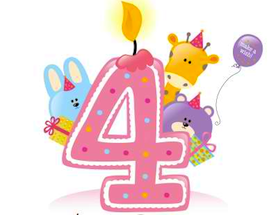 My niece, Cutie Pie, is four years old today! She is growing into a beautiful, fun, young girl. I can't wait to see what the next year brings us for our entertainment. I got to spend a week with Cutie Pie and her family last fall. I loved it. She has a beautiful smile and is so much fun. She was eager to play outside and do crafts. I dug into my preschool teacher mind set and with the help of Pinterest came up with some crafts for us to do while I was there. Many of them centered around a fall theme and Halloween, the time of year I visited. Since I was there for Halloween, the weekend before we went on a train ride to a pumpkin patch. Cutie Pie got to ride the train, pick out a pumpkin, play in a bouncy house, play ring toss and more. My parents-Cutie Pie's grandparents, Cutie Pie's parents, her brother-Lord Stanley, and myself had a fun time that day. I was amazed at what a great mommy's helper Cutie Pie was. It was her job to set the table for dinner each night. I made the mistake of putting the place mats on the table. I quickly picked them up for her to do. She is a wiz in the kitchen, too. We made brownies one afternoon. She can crack an egg, stir batter, add ingredients and more. Do we have a chef in the making? One of the best parts of the trip was when I taught her to play "Red Light, Green Light". If anyone was watching me run around the back yard I am sure it was worth a laugh. I was the one saying red light, green light and then after a few minutes she said, "It is my turn to sit". I had to laugh as I was sitting in the lawn chair while I did it. She started calling out red light, green light and then yellow light. What a smartie! I hadn't used that phrase. I hope Cutie Pie has a fabulous fourth birthday, she deserves it. I sent a special gift to her for her birthday. It is one that, hopefully, will remind her of when I visited. Check out a few pictures from Cutie Pie's third year. Halloween Party, October 2013, at Preschool-I got to go, it was so much fun! New Bike-What a good girl to wear a helmet. Easter-2014 Cutie Pie and Lord Stanley, her brother. I think Cutie Pie enjoyed it more than her brother did. Look at that smile, I smile everytime I look at this picture. Where in the World is Adaline Dyer Glover? Where in the World is Adaline L. Dyer Glover? I am an organizer! I enjoy being organized around the house and with my genealogy. One of the things that helps me in my research is to create charts. My "Where in the World" posts help me see where I have gaps in my research. I am going through my ancestors and posting once a month their census records in chart form. Adaline Dyer married Samuel Stillman Glover, Jr. in 1857 in Michigan. Skillful Master of Steam Boats on The Mississippi and Tributaries, 1874. Have you ever read "The Adventures of Huckleberry Finn"? This is the image I get when I think about the jobs my second great grand uncle, George Begole Poor had. Huckleberry Finn was set around the years 1835-1845 and George Poor was a ship master during the 1860s-1880's, but I still imagine the Mississippi River as described in Huck Finn. George Begole Poor, the second child of Samuel B. Poor and Eleanor Begole, was born 29 February 1828 in Steuben County, New York. He moved with his parents at a young age to Michigan. Eventually, he moved to the Cairo, Illinois area, where he spent the remainder of his life. 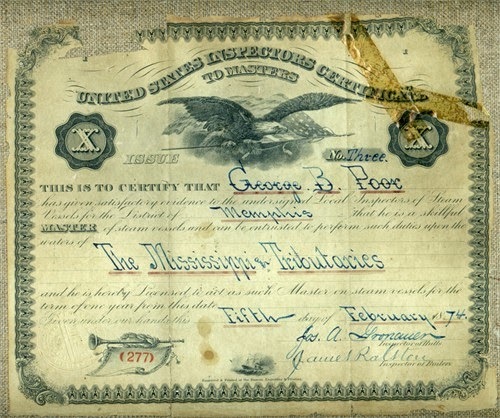 George Poor had a number of jobs throughout his 62 years of life. The certificate above is only one of many jobs George had. George's life was detailed in "History of Alexander, Union, and Pulaski Counties, Illinois" book on page 37, available at Google books. This book combined with help from another Poor researcher gives a pretty good picture of George's working life. Unfortunately, George's life ended on the Mississippi River. The last person to see George said he was walking toward the Mississippi River. He was missing for days and rewards were offered for information on his whereabouts. His body was found about 50 miles downriver in Hickman, Ky. George died June of 1890, having spent forty years working in transportation. Newly acquired free books for my library. Many readers are going electronic with their books, but I am holding out. I still love the feel and smell of a book. I like holding it in my hand and perusing the pages. I like looking at them in my library and at my public library. I am a book geek you could say. I collect cookbooks and now I am amassing a nice genealogy library. I don't buy a book just to have one, whether it is a cookbook or a genealogy one. I am picky. Cookbooks have to enhance what I already have, be one from a respected chef, or have a family community connection. I am selective with my genealogy book purchases, too. The genealogy books I add to my library are ones I would use over and over again. They have to be directly related to my research or to further my genealogical education. I have general research help books, specific country guides, genealogical dictionaries, New England resources, and more. Typically, I don't buy family genealogies. I have one in my library. If you want to see the titles I have in my library, check out the My Library tab at the top of this page. You can imagine my excitement at the last Calhoun County (MI) Genealogical Society when a fellow member brought five boxes of books for members to take if they wanted them. All Free!!! As Vice President, I was reluctant to be the first one to take some, but then someone said it was one of the perks of being an officer. (There are other perks?) The donor didn't want to take any home and was worried no one would want them. I saw seven that I would use, and have used at the library many times. Someone said, take them. That was all I needed. I picked up an empty box and put my seven in it. Six of the seven are related to New England genealogy and one was a Pennsylvania reference book. All books I am grateful to have in my library, now. The Genealogical Dictionary of New England (4 Volumes) by James Savage: I have used this book on ancestry, at the library and have copied many pages from it. It will be nice to have as I discover new ancestors from New England. Genealogical Dictionary of Maine and New Hampshire by Noyes, Libby, and Davis. This is another book I have looked at the library for. So far, I don't have Maine ancestry, but I do have New Hampshire ties. The Pioneers of Maine and New Hampshire by Charles Henry Pope. I have the Pioneers of Massachusetts by the same author and use it a lot. I hadn't used this book before, but thought it would be a nice companion piece to the Massachusetts book. Pennsylvania Marriages Prior to 1790. My maternal grandmother's side of the family immigrated to Pennsylvania in the early 1700's. I picked this book up to look for family members. I found many and will need to take some time to go over it thoroughly. The donor worried for nothing as members were more than happy to take these books off her hands. The books were from a friend's father, who had passed. No one in the family wanted them. Our members did. Other books she brought were for resources from southern states. Every book was taken by the end of our meeting. I guess I am not the only one who likes books. I know these books are available at libraries, on ancestry.com, and other places online, but as I said I like books and I couldn't beat the price-free. If you want to read more about my genealogy library I wrote a post "My Genealogy Library and How I Built it Economically." I love looking at the wedding pictures my mother has in her photo albums. I enjoy seeing the type of dresses and flowers chosen by my relatives. I didn't know my Aunt Lola at this age and enjoy seeing younger pictures of her. I like to compare how she is today versus her younger years. My Aunt Lola, who is 94 years young, looks similar to this picture. She has a few more laugh lines and gray hair, but you can see the young girl in her today. Plus, her mind is still very sharp. She is my go to Aunt when I need help identifying family pictures. The wedding party picture was another one I found in my mom's photo albums. I tried to envision the color of dresses. My mother, the first one on the left, knew, but I waited to ask her. I guessed that her dress was yellow and Luella's pale blue. Was I right? I was only half right. My mom's gown was pink and Luella's was blue. Luckily, I had my mom and Aunt Lola for a reference to ask. Source: Manistee News Advocate, (Manistee, Michigan), 11 June 1945, "Speak Vows in Church Sunday" page 2; column 5, microfilm owned by Library of Michigan; Library of Michigan, Lansing, Michigan. Miss Lola M Fredrick daughter of Mr. and Mrs. Otto Fredrick of Brethren and Walter F. Brown son of Edward Brown of Route One, spoke their marriage vows Sunday, June 10 in Trinity Lutheran church, Onekama. The Rev. E. M. Ruhlig performed the 4 o'clock ceremony before an altar banked with palms and baskets of carnations, narcissi and snapdragons. Mrs. William Briske served as organist and Mrs. Em M. Ruhliz sang 'O Perfect Love. The bride given in marriage by her father wore a gown of white silk chiffon in the princess style. she carried white gardenias and snapdragons. Miss Audrey Fredrick attended as maid of honor wearing a gown of pink taffeta and carrying a bouquet of matching roses and snapdragons. As bridesmaid, Miss Luella Brown wore a blue chiffon gown and her flowers were like those of the maid of honor. Attending the groom were Wilfred Grabowski of Manistee and Henry Brown of Onekama and the guests were seated by the ushers, John Fredrick of Brethren and David Brown of Onekama. 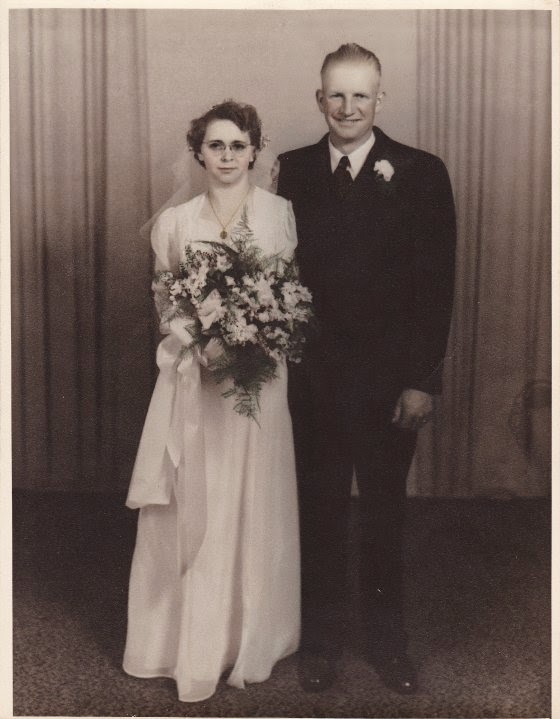 For her daughter's wedding Mrs. Fredrick wore a brown silk dress with white accessories and a corsage of white carnations. In the evening a reception was held for about 130 guests at the Brown residence on Route One. Following a wedding trip the couple will be at home to their friends at Route One, Manistee, Box 211. Now that we have the fashion of the day out of the way, who was who? The Church: Trinity Lutheran Church, Onekama, Michigan-The Fredrick Family Church where many Fredrick events, including my baptism, took place. Unfortunately, Uncle Walter died in 1977, after only 32 years of marriage. Aunt Lola never remarried. They had four children: Bertha, Walter "Fred" , John, and Faith. Between the photo's, the newspaper announcement, the Bride-Aunt Lola, and my mom, I have a pretty good image in my head of her wedding day. *Note: I have chosen to use the Fredrick name for this post, instead of Fredricks as the family used later for a surname because Fredrick was the spelling at the time of the marriage. Source: Manistee News Advocate-Manistee Daily Advocate, (Manistee, Manistee, Michigan), 28 September 1905, column 3, microfilm; Manistee County Historical Museum, Manistee, Michigan. Leonard Engelhuber, aged 69 years, died at 11 o'clock last night on the county road of erysipelas. The funeral services will be held from the German Lutheran church on Fourth street Sunday afternoon. 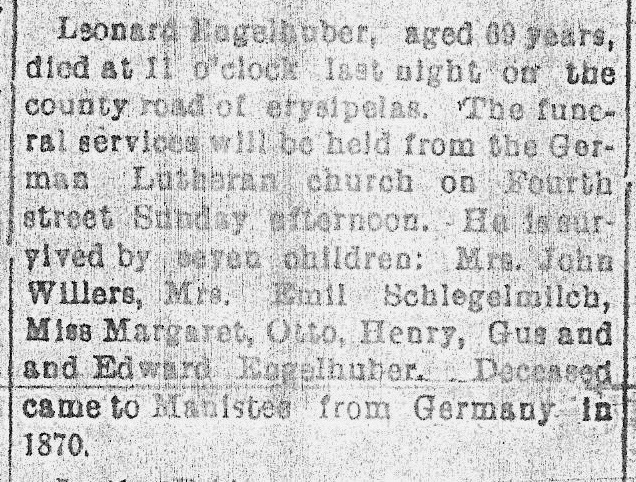 He is survived by seven children: Mrs. John Willers, Mrs. Emil Schlegelmilch, Miss Margaret, Otto, Henry, Gus and Edward Engelhuber. Deceased came to Manistee from Germany in 1870. Leonard Engelhuber was my great grand aunt's husband. He married Amalia Fredrich, daughter of Christoph Fredrich and Susanna Koenig, my maternal second great grandparents. Amalia was still living at the time and I found it interesting that she wasn't included as a survivor. Those Places Thursday: Yes, There Really is a Kalamazoo! Yes! There really is a Kalamazoo and I lived there twice in my life. First, was when I attended Western Michigan University. The next time was when my husband accepted a counseling job at the Lakeview School District in Battle Creek, Michigan. We were unable to find housing in Battle Creek and we moved to Kalamazoo, about 25 miles from Battle Creek. My friend Mary, and her husband, Matt, knew the owner of the home and recommended us to her. The house was for sale and we knew it was only a temporary stop in our lives. This beautiful, two story home sat on the corner of Race and Dewey. The neighborhood was in transition during the nine months we lived there. It wasn't a neighborhood I would have wanted to buy a home in. Luckily, we were surrounded by long time residents and they welcomed us with ease. The home had beautiful lead glass front windows and one side window. The interior had all original wood trim. A beautiful wooden staircase greeted you at the front door. The entrance way could be closed off from the living room with original wood pocket doors, a great way to keep the kids corralled. A large cement patio and back yard were favorite playing spots for Kirsten and Travis. It had two bathrooms, four bedrooms, a walk-in attic, living room, formal dining room, kitchen with a set of back stairs to the second floor, a basement with a humongous gravity fed furnace. It was one of the warmest homes I lived in. We built many memories in our Kalamazoo home. It was just a short walk to the Washington Square library and we would walk to it regularly. A block away was St. Joseph Catholic Church and School with a playground we used on weekends. It was close enough to downtown Kalamazoo that we could walk it. We only did that once for the Kalamazoo Christmas Parade. We took advantage of everything Kalamazoo had to offer. A Children's Health Fair where Kirsten took her cabbage patch doll that's toe stitching had come out, they put a band aid on it for her. Numerous festivals were held at Bronson Park in Kalamazoo and we went to a few. Pumpkin patches, holiday lights, shopping and more were part of our activities that year. Our friends, Matt and Mary, lived close by. They had three children, Drew, Mitchell and Megan. We would get together and the kids enjoyed playing with each other, most of the time. It was a home of many firsts for Kirsten and Travis. Kirsten was 3 years 8 months old when we moved to Kalamazoo and Travis was seven months old. The pictures below detail some of the important firsts in Kirsten's and Travis' life. We lived here from August 1987 to May 1998, just a short nine months. Kirsten's first day of Preschool, September 1987. She went to Milwood Methodist Co-op Preschool with her friend, Mitchell. Travis' first Halloween, October 1987. We went to Binder Park Zoo in Battle Creek for Halloween and didn't go door to door trick or treating, but we handed out candy. Travis' first Christmas, December 1987-the joy in his eyes when I carried him downstairs Christmas morning was priceless. See the beautiful wood banister. Travis celebrated his first birthday here in January 1988. 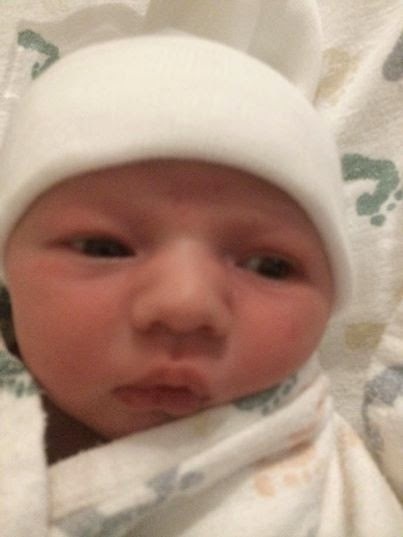 He celebrated many other firsts as well, including his first tooth and learning to walk. He was such a happy baby. Kirsten with her Great Grandma Lee (Leona Dollaway Corcoran), who came for Grandparent's Day, May 1988, at preschool. Kirsten's grandparents were living in Florida and Texas at the time. When getting ready to move, I walked into the spare bedroom and found this. Travis was 16 months old at the time. He was quite proud of himself. 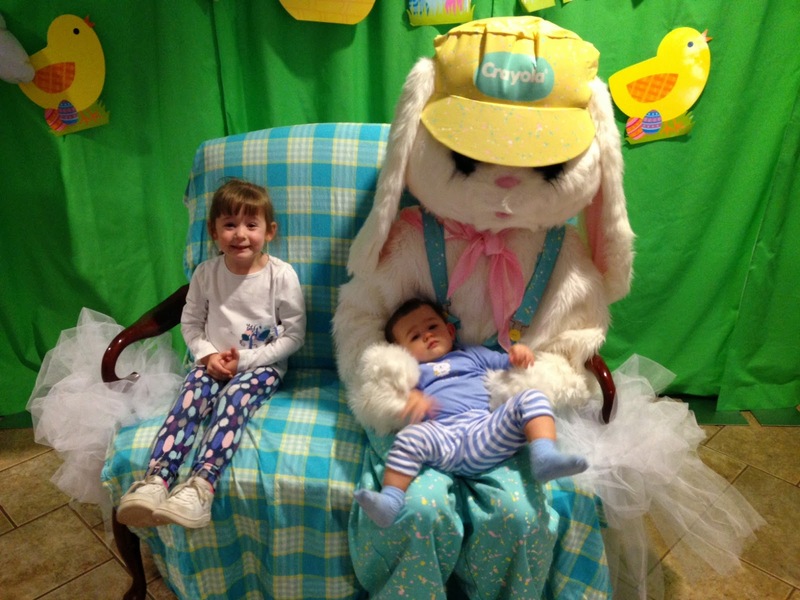 His sis, Kirsten, wasn't going to let him have all the fun. She got into the climbing too in May of 1988. Our decision to move was two-fold. One, the house we were living in was being sold and two, we were of the opinion at the time that it was important to live in the school district and community that was providing us with a pay check. We moved to Battle Creek on May 20, 1988. My second great grand uncle, Dennis H. Glover, is the son of Samuel Stillman Glover and the brother of my second great grandfather, Samuel Stillman Glover, Jr. He married Caroline E. Martin, the daughter of Whipple Martin on 2 December 1848 in Howell, Livingston, Michigan. It isn't often I spend time researching a second cousin, three times removed and if I didn't have the settings on Roots Magic to help me, I wouldn't know the relationship, but Charles W. Glover and Oriska Worden made headlines and I found a lot of them. Today, many would be found on the front page of a tabloid magazine as sensational as they were. Why were Charles W. Glover and Oriska Worden newsworthy? It had to do with beauty, fame and fortune. Charles W. Glover was the son of Henry Pierce Strong Glover, a millionaire manufacturer and one time mayor of Ypsilanti, Michigan, and Nancy Kishler. Oriska Worden was the daughter of F.W. Worden, a decorated Civil War veteran from Michigan. Charles and Oriska lived a privileged life growing up. Oriska went to Mount du Chantal Convent School in West Virginia. She ended up at the Conservatory of Music, in Ypsilanti, where she met Charles. Charles grew up in a upper class home as his father was a successful manufacturer in Ypsilanti, Michigan. They fell in love, married and the rest is history; except, that Charles and Oriska did not live happily ever after. Charles and Oriska Worden Glover were married 20 October 1892 in Petoskey, Michigan. It was during their honeymoon that things fell apart according to newspaper accounts at the time. Plus, Charles and Oriska didn't have the blessing of Charles' mother, who they were living with until their home was completed. Oriska is quoted as saying, "Nothing I could do seemed to please Charley's mother." A few months after marriage Oriska decides to move to Paris to further her music education. Charles would not follow her. It is during her time in Paris that Charles decides to divorce her. Oriska returns to the United States three years later and finds out about this divorce. She states she wasn't notified of his attention to divorce. This is where the newspaper accounts get tabloid-ish. Oriska intends to sue Charles for $10,000 a year alimony. She intends to name his parents in a $100,000 suit for alienation of her husband's affection. Oriska at this time is a well known, successful, opera singer. Hence, the front page news. The news of her intention to sue and all the details of her marriage is covered nation wide. Below is just one of many news articles I found. Transcription is below. Ypsilanti, Mich., Sept 24.-Oriska Worden, prima donna, a graduate of the Normal conservatory of this city, soon will wed a wealthy New York broker, whose name is withheld. She was married to Charles W. Glover of this city, several years ago. Glover is a wealthy manufacturer. Family disagreement caused a parting, and she went to Paris, France. 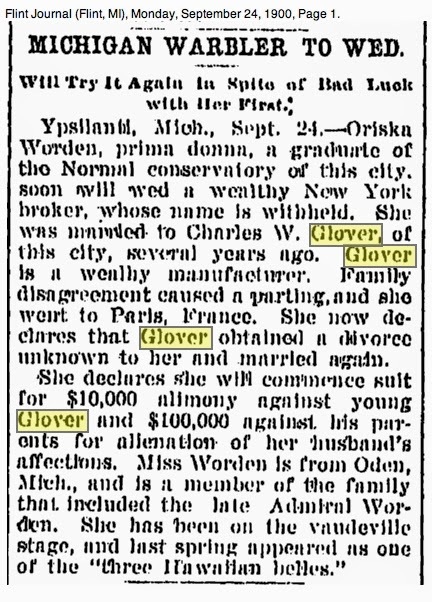 She now declares that Glover obtained a divorce unknown to her and married again. She declares she will commence suit for $10,000 alimony against young Glover and $100,000 against his parents for alienation of her husband's affections. Miss Worden is from Oden, Mich. and is a member of the family that included the late Admiral Worden. She has been on the vaudeville stage, and last spring appeared as one of the "three Hawaiian belles." In this case, beauty, fame and fortune did not make a good trio. Oriska and Charles did not have their happily ever after. I never found information on an actual suit against Charles or his parents. Charles married Ida May Foss in 1895. Oriska Worden continued her professional career as an opera singer and vaudeville actress. My father, Bruce Glover, was a junior high and high school coach for over 50 years. He loved anything and everything to do with sports. He retired from teaching and coaching in Texas, moved to Michigan, and went back to coaching. He enjoyed it that much. He was a player, a fan, and a coach. He has coached a lot of teams throughout the years and the picture above is from one of his first high school basketball coaching teams. This picture is special for a number of reasons. 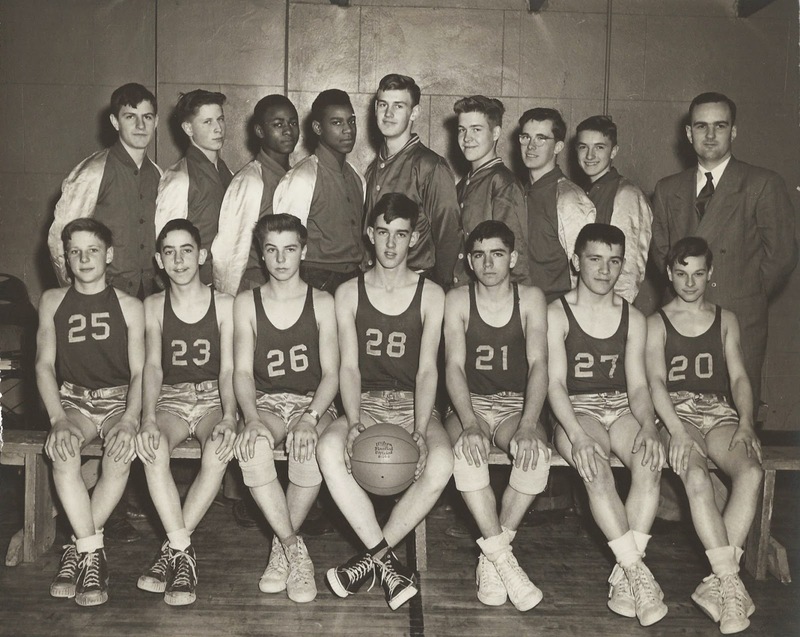 First, it is one of my Dad's first basketball teams. Next, in the front row, second from the right, is my Uncle Norman. Norman Fredricks was the youngest brother of my mom. Plus, Brethren holds special memories as it is where my parents met and many family members lived, and still live, today. I found this picture in a photo album at my parent's house. My mom and dad were able to identify a few of the players, but not all. How was I going to find out the names of the rest of the team? Facebook to the rescue! I posted the picture on my Fredricks Genealogy page and let others do the work. One cousin asked her mom, who was in high school at the time, and she identified a few more. Another cousin had her dad's school yearbook and was able to fill in the rest of the names. All of this was done from their homes, no road trips needed. This was just the first of many sports team photo's I found at my parent's house. I guess I will have a few more blog posts to write.